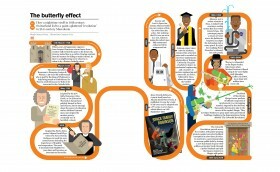 The butterfly effect from Delayed Gratification, the Slow Journalism magazine. In our latest butterfly effect, we connect the dots between a nighttime stroll in 18th-century Switzerland and the paint-splattered ‘Colourful Revolution’ which spread through Macedonia this year. This infographic was taken from issue #24 of Delayed Gratification. Head here to find out what else is inside our new issue and purchase your copy.